spoiler alert: there are no right or wrong design philosophies. Making your home fit with your lifestyle and into your aesthetic is hard enough without adding children into the equation… Which is why we’re always so impressed with the family-friendly homes domino features—white sofas and all. As it turns out, various designers and parents have different philosophies on how exactly to make a home well-designed while still being suitable for young children. Keep reading to learn how seven mothers make kid-friendly spaces for themselves as well as their clients. WHERE DO YOU START WHEN DESIGNING A SPACE YOU KNOW CHILDREN WILL SPEND A LOT OF TIME IN? Safety is definitely where I begin. I want to be able to sit in a room with my children and know that they are safe without having to keep an eye on every single thing that they are doing. I do the typical childproofing with baby gates on stairs, plugs in electrical sockets and internal cabinet locks on cabinets that might have cleaning products or breakables inside. Being realistic is next. Kids will spill things and mark things so I’m very thoughtful with the colors and textures of fabrics that I use. One of our sofas is navy velvet. The dark color and the texture of this velvet have been great in hiding little mishaps. Our other sofa and chair have removable covers and have been washed on many occasions. HOW DO YOU MAKE A SPACE KID-FRIENDLY? FROM THE FURNITURE TO DECOR, ETC. WHAT DO YOU SPLURGE/SAVE ON, TRICKS OR ALTERNATIVES YOU’VE FOUND WORK? Two of my favorite things that we have done is no coffee table and low furniture. It has created this really lovely space that is so comfortable for everyone. You can sit on the sofa, or sit on the floor with your back against the sofa. You can play with the kids on the floor or comfortably do your own thing while they are playing right there. They can climb on the furniture and when they inevitably take a tumble they don’t have very far to fall. We also have a deceptive number of toys, books and dress up clothes hidden away in cupboards and baskets. Everything is easily accessible to the children and out of sight when they are asleep. HOW DOES DESIGNING A “KID-FRIENDLY” SPACE IMPACT OR CHANGE YOUR DESIGN PROCESS? I’m a minimalist and I think there is an innate child friendliness in minimalism because there isn’t much around for them to get into. We probably have fewer low lying vases of flowers and objects than we might otherwise have but I don’t feel we have had to compromise anything aesthetically because of our children. WHAT DOES THE DESCRIPTOR “KID-FRIENDLY” ACTUALLY MEAN TO YOU? A room that is safe and fun for a child to be in. A room where they can spill a drink or get chocolate on something and it isn’t the end of the world. A room where they aren’t constantly being told not to touch things. I FEEL LIKE THERE’S KIND OF A COMMON BELIEF THAT YOU CAN’T HAVE A TRULY STUNNING SPACE THAT ALSO WORKS FOR KIDS. HOW DO YOU FIND A BALANCE BETWEEN MAKING A BEAUTIFULLY DESIGNED HOME THAT ALSO WORKS FOR YOUNG, POTENTIALLY MESSY CHILDREN? It’s all about perspective. There is definitely a belief that things needs to be dumbed down for children, be it interiors, clothing, or food. You can get a stain out of a pretty cotton dress or button down shirt as easily as you can a cotton t-shirt. The same principle rings true in interiors, beautiful can be practical too. I do think it’s important to hold your children to certain standards in your home. We have rules like only eating in the kitchen, no jumping on the sofas, it’s ok to make a big mess as long as you clean it up when you’ve finished playing. It’s a work in progress along with every other aspect of parenting, but I try to teach them to be respectful of their environments. The first thing I ask a client who wants a child-friendly space is the age, energy level, allergies and if there are any disabilities to ensure that the space is appropriate for their children and their friends. As any parent knows, the most important thing about a kid-friendly space is using our Clean Design protocol to ensure that it is non-toxic from the foundation to the furnishings. We select floor coverings that are washable like FLOR carpet tiles, suggest rubber (not vinyl!) playmats, and materials that are both durable and easily cleaned. For safety, corners are often rounded and lighting is also important, as well as anchoring shelving to the wall to prevent tipping, and we only use no-VOC wall paint to ensure no off-gassing. My book, Clean Design, has an entire chapter devoted to nurseries/play spaces and all the non-toxic things a person can do to design on a budget or to splurge. One of the biggest trends in kid-friendly spaces is to have a single wall with a whiteboard or chalkboard (use only dustless chalk! )‎ wall. And we always mix high-low. For example, the crib/bed might be from a high end store and the child friendly plastic chair and the drawing table might be from IKEA, which is easy to clean. My belief is that color, pattern and texture are the most important things for a child’s space. Whether a colorful tent, colorful floor tiles and solid white or primary colors, the space should have a theme that allows them to know it is “theirs” and also have the potential for them to age in the space without too many alterations outside of paint and decorative items. One of the best things is purchasing a bed that can “grow” with the child, yet be in a classic style that will complement them at their current age. Pro tip: Use unexpected items to furnish your space. Designer Maryam Nassirzadeh uses a vintage mail sorter to smaller toys. HOW DID DESIGNING A “KID-FRIENDLY” SPACE IMPACT OR CHANGE YOUR DESIGN PROCESS? It didn’t really impact anything too much. Visually, I’m drawn to more formal and manicured living rooms. Comfortable and functional design always wins in the end. Where you can relax and put your feet up, with kids or without. HOW DO YOU MAKE A SPACE KID-FRIENDLY? I love open floor plans with combined living kitchen and dining, this allows everyone to spend more time together, cooking and meals together are important in our house. I designed this space to open up onto the backyard, so the living space flows into green space and the kids can play. Toys inevitably end up outside of their defined play areas. So I make sure they “blend” into the living space so the house doesn’t end up one big playroom. Baskets are great, they look great and kind hide everything. I’m also keen on built in storage cabinets that are extensions of the walls. It creates a continuous clean look and you can hide all those plastic toys inside. They can get thrown in at cleanup time. Kids love to draw and paint but it’s tricky to have everything on hand for these projects. I always dedicate one wall near the kitchen for art. Whether it’s a chalkboard wall or a shelf with paint, jars, and paper on the wall. It’s ready to go. I KNOW YOU HAVE A WHITE SOFA, WHICH MOST PEOPLE WOULD RULE OUT IMMEDIATELY. HOW?! That’s always a big topic for people when they talk about my home. They always ask “How do you keep it so clean? !” I have had white sofas for as long as I can remember. Slip covers are essential. Just throw it in the wash.
A space with lots of fragile crystal figurines and non-washable silk furniture could pose some risks with kids. 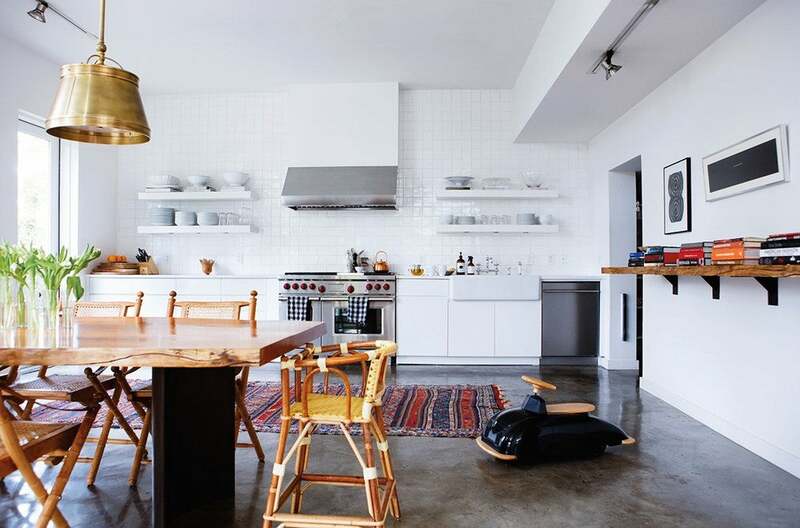 HOW DO YOU FIND A BALANCE BETWEEN MAKING A BEAUTIFULLY DESIGNED HOME THAT ALSO WORKS FOR YOUNG, POTENTIALLY MESSY CHILDREN? Make sure you can wash everything! And decide on what’s important to you. How much time do you want to spend washing or fluffing something (a sofa) in your living space? If you don’t want to be bothered with worrying about washing, making these changes but can push you in new and interesting directions. HOW DO YOU BALANCE A DESIGNING A BEAUTIFUL SPACE WITH KID-FRIENDLY DECOR IN MIND? So, in our new home, here’s what I’m going to do. I’m going to do a colorful rug, so we’re probably going to find an old version that’s really colorful and really beautiful, but beat up-able, you know something that can’t be destroyed easily by a cup of coffee or whatever, because kids, they’re so messy. And then a darker sofa. All the furniture needs to be either upholstered and soft, like my goal is always to buy stuff that they can’t destroy and that can’t destroy them. It needs to not be able to hurt them, but also they need not be able to hurt it. And really heavy bottomed things. You want things that they can’t easily knock over, and they will. They’ll pull themselves up, they’ll easily knock over most side tables, so you need really heavy-bottomed things. And then all of your pretty accessories up high. Right now all we have low is pillows and books, and even books they will kind of destroy, although they lose interest pretty fast. But yeah, we put all of our pretty things and shelving up high. You’re looking at Erika’s home school room! We love the bright green backs of the shelves. I start by defining the space and determining how the space will function for the child based on his/her age. Is this a room for just sleeping as the case for when multiple children share a bedroom. Or is this a place for play only, or a space for the combination of both. Designing a kid-friendly space is totally different from designing a traditional space. Autonomy and intellectual stimulation are both important considerations needed when I think about creating rooms for children versus adults. Hopefully the end result will encourage independence, self-confidence, and self-awareness. For example, if I’m designing a room for a preschool age child, I look towards a preschool classroom for inspiration. The furnishings are low scale, storage is easily accessible, accessories are picture driven, and the overall space is very colorful. I tend to splurge on upholstery because let’s face it, life gets messy and even more so for kids. They need rug and furniture selections that are durable and easy to clean. Bonus points are given if the furniture can grown with them. If not, you will get a partial return on your investment when it’s reused for the next sibling or resold in a furniture consignment. Kid friendly means carefree, worry-free, and fun. Again, stain protection and durability play the biggest roles in bridging the parent/kid decor gap. Next are furniture shapes. Hard edges and corners cause major stress for new parents vs. veteran parents. A square marble coffee table may be thought of as a potential hazard for a new walker, so why not replace that piece with a square ottoman and add a round top marble end table? Some things may require substitutions in how they are used however with thoughtful design solutions you never have to compromise style. Pro tip: Accept your home’s imperfections. Our summer cover girl Ulla Johnson has her own philosophy on making her space family-friendly. To design a kid-friendly space, I start by asking questions to the clients and their kids to get a good feel for how they live. Where do they watch TV, do homework, entertain? Is dinner at the dining table or in front of the TV? Once I get a vibe for how each room will be used, I can create an fun and functional space that will grow with the family. Moms don’t have enough time to fret about a precious fabric or rug, but they also shouldn’t have to sacrifice the beauty of a room. Kid-friendly spaces should be functional and low maintenance, but not ‘dumbed down.’ Thanks to indoor/outdoor fabrics and products like FiberSeal, a lot of ‘smoke and mirrors’ can make a gorgeous home combat even the worst spills. I have so many clients that start our initial meeting off with the statement, “my kids are disasters.” I rarely find that it’s true! But, we often pick a beautifully patterned rug that can camo small stains, and outdoor fabric as indoor upholstery just as an insurance policy. Also builtins with closed cabinets below and bookshelves above is both a anchoring architectural detail and functional storage for the toys and games. Most of my clients have kids and dogs…we’re ready for them! There just needs to be a little more focus on the wear and tear of the materials presented. A gorgeous leather sofa that ages beautifully is often a centerpiece of a family room. Also, storage is key…everything should have a place. Kids are more likely to clean up if there’s a clear plan of where their toys and art supplies go. When kids are in the picture, it becomes about the materials: upholstery and rug that clean easily and can endure movie nights and slumber parties and a coffee table that’s sturdy enough for a dance party. Drawing up some built-in cabinets and bookshelves is usually in the first stage of the plan: a worthy splurge. I start with the floor and work up. Since I know the children will spend a lot of time on the floor, I make sure the floor is both natural (wood, jute, wool), soft (when layered with a rug), and will handle spills and accidents well (whether that means easily wiped up or a good pattern that will camouflage stains). Once I have the floor/rug picked out, I work my way up and have the furnishings not only exhibit the same qualities, but also coordinate well with that main design element. The style won’t suffer, but the material and color choices will be different. Fabrics that are either wipeable (leather or plastic) or easily washed (denim, dhurries, cotton, and linen) and colors that will hide grubby fingers (light greys, blues, and browns) will dominate the scheme. Furniture should be flexible and easily moved out of the way to open up the play space, as well as avoiding sharp corners. I see that even very young children can be taught to be respectful of the things that are important to you. People don’t have to buy ugly cheap things now with the goal of swapping them out 10 years from now when their children are older. They can buy beautifully made pieces that they love, enjoy them in the present time, and let their kids know to be mindful of their interiors. You would be surprised with how children can take ownership of their home’s interior design. I have a few tricks to make a space feel fully decorated without sacrificing high end pieces. The first thing I do is mix in vintage furniture since these will already have a few marks and scuffs on them from age. If a few more are added from being in a family home it’s no big deal and no one gets upset or even notices. Vintage pieces add loads of personality to a room and are usually cost effective compared to buying brand new. Second is filling a space with plants. They add color, texture, and sculptural form without the hefty price tag of actual objects of art and it’s nice for kids to have a daily connection with living things. Last is using fiber art on walls. Children will be attracted to art and want to touch it. Fiber art like macrame wall hangings are a safe way to add texture and color to your blank walls without fear of what happens to it when kids reach for it or get rambunctious in playing. Kid friendly to me means “not precious”, but who wants a precious house anyway?! Kid friendly is also dog friendly, or guest friendly. It suits many kid free people’s lifestyles.